In our previous post we have seen the LDR sensor Circuit and which was pretty easy one, now in this post we will go further with Cell Phone Detector Circuit. 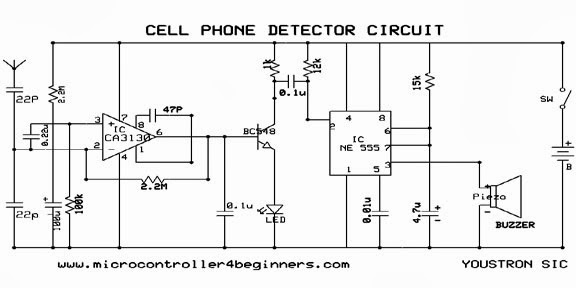 The circuit can detect the incoming and outgoing calls and SMS even if the phone is in silent mode. When it detects the presence, alerts by beep sound using buzzer. It can detect the presence within one and half meter range. With this circuit we can be familiar with IC opamp, 555timer. Its a good practice for beginners to wire this circuit on the breadboard and verify its output. Note:Input voltage 9-12v(tested with 9v as well as 12v). We can replace the antenna with 2meters of wire(any gauge). I have tested this circuit and it works well, you can watch video below. sir how can we simulate this ckt in isis proteus as we don't have any cell phone in it. We cannot simulate this ckt. I made real hardware to check this ckt and it worked fine.